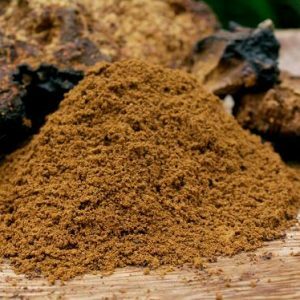 Chaga is a mushroom, but to prepare it, it is not sautéed, grilled, or even eaten fresh, the way many mushrooms are. It appears as a hard conk that protrudes from a birch tree. This charred looking conk is full of healthy components such as antioxidants, betulinic acid, and melanin. However, these healthy components need to be released from thick cell walls, so that the body can absorb them. One of the easiest ways to do that is to make Chaga tea. The warm water breaks down the chitin in the cell walls and allows the body to absorb beneficial components. Making Chaga tea is simple, and it can easily become part of your daily health routine. 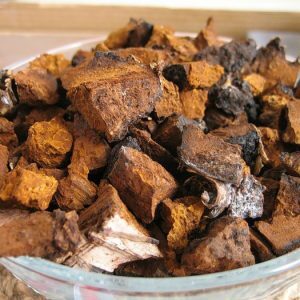 Chaga comes in a variety of forms; chunks, powder, extract, and even tea. You can make a tea concentrate from the Chaga chunks. Simmer the chunks on a consistent heat in a slower cooker. You can do this overnight, or all day, up to 12 hours. The longer the chunks simmer the thicker and stronger the tea will be. This creates a tea concentrate. You can store the Chaga tea concentrate in the fridge and simply add water and warm for a quick cup of tea. Or, you can use the concentrate to make smoothies, lattes, or blended drinks. The chunks can be steeped at least one more time if you store them in an air tight container between uses. 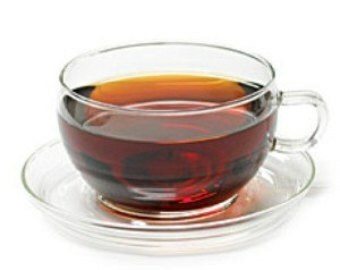 If you enjoy the process of steeping tea a cup at a time, you can use Chaga powder. Place a few teaspoons of Chaga powder into a tea ball. Pour water that has been heated to just below boiling over the tea ball, and then let it steep until it reaches the desired strength. Making Chaga tea with Chaga extract is simple and easy. Add ½ teaspoon of extract to warm water. The water should be 122º at the warmest so that the beneficial compounds aren’t damaged. 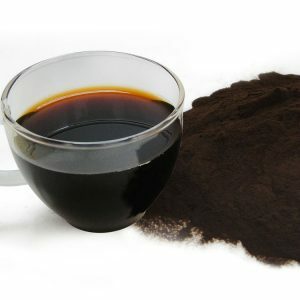 Extract makes the non-water soluble compounds in Chaga available because the processed mushroom itself is being dissolved in the water, not just steeped. Chaga tea has a strong earthy flavor, with just a hint of vanilla. A touch of bitterness indulges coffee lovers, but is an acquired taste for others. To doctor your tea a bit, add a splash of almond milk, and a touch of honey. The nutty flavors of the almond milk complement the earthy flavors of the tea. It also adds a richer texture to the tea. The sweetness of the honey takes off the bitter edge of the tea. If you would rather use a low calorie sweetener, try stevia instead of honey. Making Chaga tea part of your daily health routine can give you a boost of energy when you need it. It can also support your immune system, and help your general well being. Incorporate Chaga tea into your morning routine, your afternoon snack break, or your pre-bedtime ritual. A cup or two a day might be what you need to feel well all day long.